Zcash (ZEC) is an open source and decentralized cryptocurrency created by Zooko Wilcox-O’Hearn in 2016. It is based on the Zerocoin protocol. This protocol supports zk-SNARKs – it provides the option to make the transactions completely anonymous. Zcash (ZEC) maintains a secure ledger of balances which is kept away from the stakeholders in order to give complete privacy to the users. Zcash protocol facilitates encryption at Metadata level, and the zk-SNARKs feature is used for checking the authenticity of the transactions. With a negative ROI (Return on Investment) of negative 98.36 %, Zcash (ZEC) is ranked at 22nd in the crypto market. The current market cap of 11th April at 02:04 UTC is 447,807,129 USD. The value of each coin in terms of USD and BTC stands at 71.19 USD and 0.01342703 BTC respectively. The 24 h volume at the same UTC stands at 332,560,560 USD. Since the starting of the year, the coin has been traded around 47 USD to 55 USD. The value of coin has been inconsistently traded in the market. But the last week’s profit gained by 50 %. By comparing the figures of the past month, we can see the gain momentum Zcash (ZEC) has yielded. The market cap of 11th March was 308,700,580 USD. The value of each ZEC coin stood at 50.88 USD and 0.01289847 BTC. The current market cap has inflated by 45.06 % over the past month’s data. The same way, each coin has gained 39.91 % in the past 30 days. 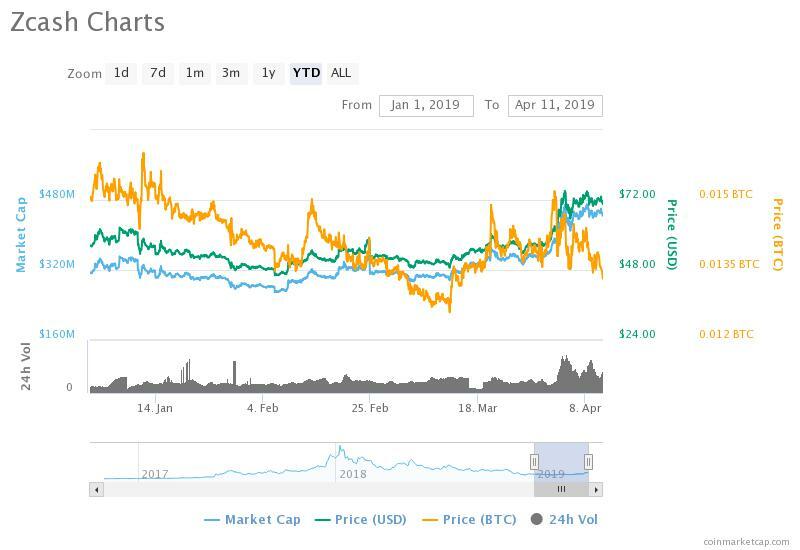 But, it should be noted that the real growth was achieved after April 1st, in consonance with the other cryptocurrencies of the market. Due to some market interventions, the value of Zcash (ZEC) has increased beyond expectations. The value has gained by almost 50 % in the last week and the way until it encounters the next resistant looks bullish. As the value is now hovering around 70 USD, the next resistant should be somewhere around 75 USD. Once it touches 75 USD, it will stagnate for some time to rise further. The short term outlook looks bullish making the current price moderately profitable to make a buying position. The medium-term outlook also looks bullish with a target of 80 USD to 82 USD. In the long term outlook, the value of each coin may reach as high as 100 USD, giving almost 100 % profits on long-term holders’ investment.